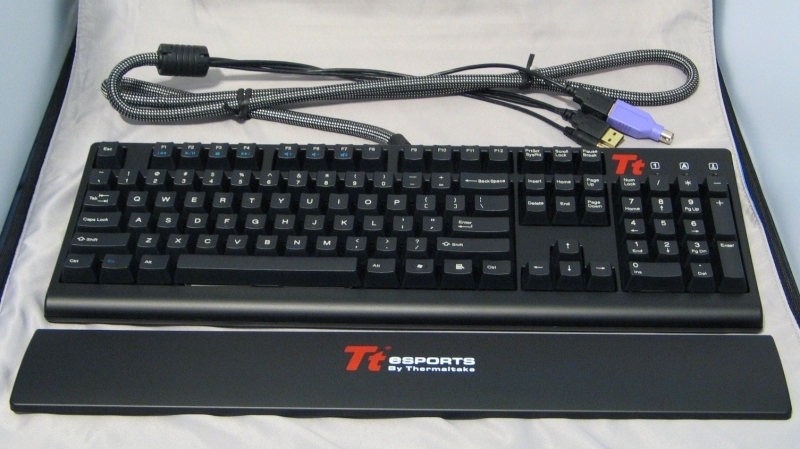 As the popularity of the eSports movement continues to rise, more and more manufacturers are looking to the demand for quality PC peripherals as a market to be served. Thermaltake, who have long catered to the PC gaming enthusiast, have reacted to this trend by establishing the Tt eSPORTS brand. 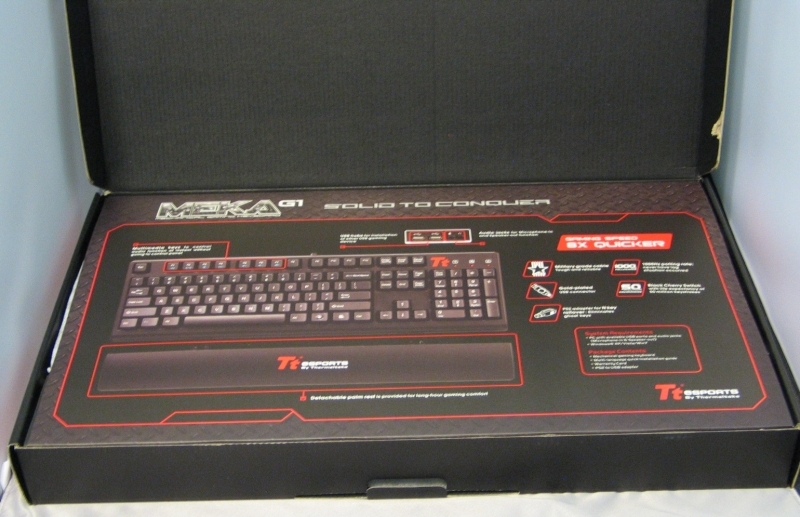 Today, we’ll be looking at one of their high end entries in the gaming keyboard market, the MEKA G1. Up to 1000Hz Polling Rate – 8x quicker than regular gaming keyboard; Never lag for action performing Yes, you can overclock the USB polling rate to 1000Hz, and in theory this results in faster response. That said, the debounce algorithms in any decent keyboard controller make any polling rate above 200Hz a waste. 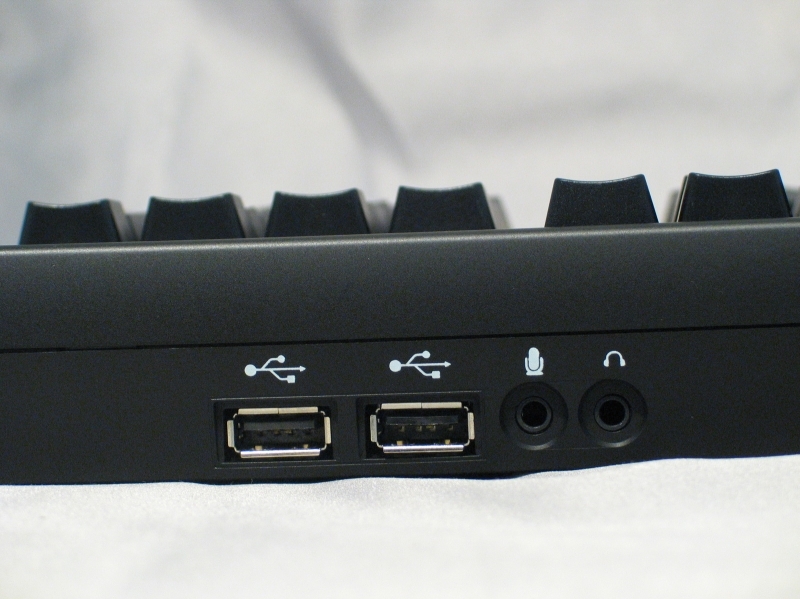 Cherry Black Mechanical Switch – Enables an excellent gaming elastic capability with life expectancy for up to 50 million keystrokes Pretty much spot-on here; Cherry’s MX switches are the most common mechanical keyswitches on the market, and are quite well regarded. USB to PS2 adapter – for “N key rollover” function; eliminates ghost keys There’s a lot more that goes into N-key rollover than an adapter dongle, but it’s one of the needed components. More on this later. USB Hubs – for installation of other USB gaming device. Provide easy usage of other USB peripherals. Each USB port supports up to 100mA They seem to be confusing “hub” for “port” here, but yes, this keyboard has a USB hub, fed through a second USB plug on the cable. Audio Jacks – for Microphone-in and Speaker-out function Pretty much just a pair of passive extension cables, you’ll still be using whatever sound device you had before. 7 Multimedia Hotkeys – to provide gamers the instant control of audio sound. These are standard multimedia keys, like you’ve seen on dozens of keyboards before. Military Grade Cable – tough and reliable “Military Grade” seems to be a popular phrase among Chinese and Taiwanese firms these days; probably because it sounds impressive without actually meaning anything. Gold-Plated USB Connectors – Provide reliable data or signal transmission Gold-plating the shroud is pointless ornamentation; the only part that affects transmission reliability are the four connector pins on the plastic “tongue” inside. Those are always gold, regardless of how cheap or expensive the device is; it’s a required part of the USB spec. Detachable Palm Rest – provided for long-hour gaming comfort It’s a hard plastic wedge, either you’ll like it or you’ll take it off. 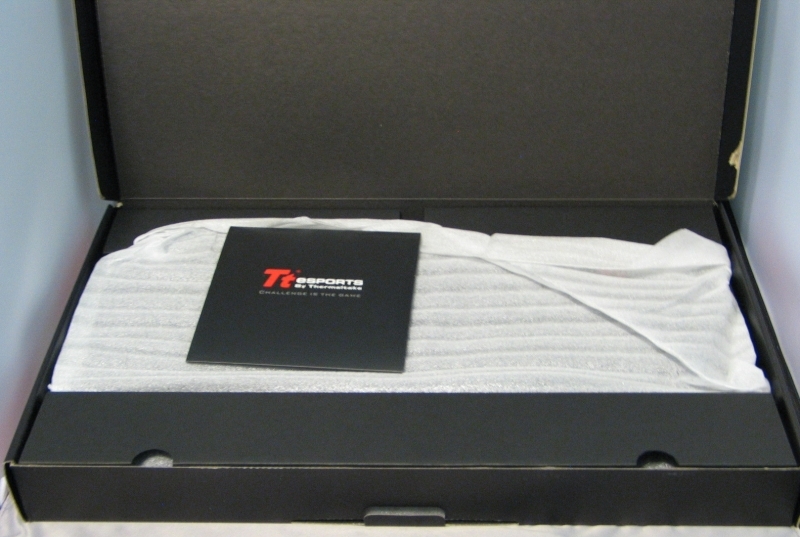 Thermaltake is going for an industrial look with the Tt eSPORTS brand, and this is reflected in the packaging for the MEKA G1, with rivets in the corners and herringbone-pattern safety tread-plates in the background. Informationally, this box does its job; you get a large profile shot of the keyboard, a quick list of features along the bottom, and not much else to distract. You would think the place to go into more detail would be on the back, but that’s just got the feature list in 15 languages. When you open the box, that’s where they go into more detail, including seemingly important info like system requirements and package contents. Honestly, they would have done better to skip the poly-lingual stuff and put this on the back instead. Lifting up that flap, we see a cardboard square enclosing the quick-start guide and warranty info, along with the keyboard itself wrapped in a soft foam sleeve. The wrist-rest is stored separately, under that short cardboard flap at the front. Here’s everything in the box, except for the documentation. Note that there is nothing resembling a driver CD; their website includes no drivers for this keyboard either. This is a double-edged sword: on the upside, no drivers required; on the downside, no advanced macro features. 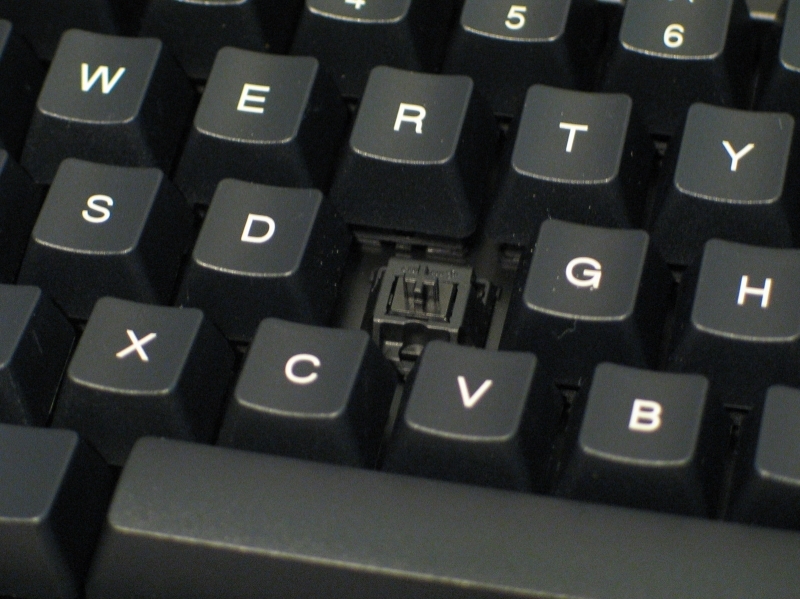 Given the lack of dedicated macro keys, this may or may not be a problem for you. As advertised, this keyboard uses all Cherry MX Black keyswitches. More on this later, in the evaluation. On the back of the keyboard, near the number pad, we see a pair of USB ports and the headphone/microphone pass-through jacks. The USB ports provide USB 2.0 speeds, but are limited to low-power (100mA max current) devices. If you were hoping to run your USB-powered external hard drive through this keyboard, you’ll be disappointed. In practice, it works just fine for flash memory sticks and input peripherals. The headphone and microphone pass-through jacks work, but they tend to introduce a hum or whine into the audio signal, in both directions.